Have you ever wanted to add an app to your Dock for quick access? If so, here are two easy ways to accomplish this. 1. Open the app. Go to your Dock and control click the app’s icon. 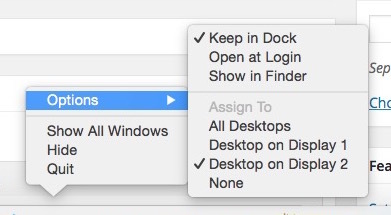 Go up to “Options” and choose “Keep in Dock.” To remove the app from your Dock do the same process and select “Keep in Dock” to uncheck it. 2. The second method is even easier. Drag the app’s icon from your Applications folder to the Dock. A space will be made. Unclick and the icon will appear in the Dock. To remove it from the Dock click and drag the icon off of the Dock until it turn transparent and has “Remove” above it. Unlock and it will turn into a cloud and disappear. Have a tip you’d like to see covered? Leave a comment below.